Seminal, utopian, enigmatic – all these words and more have been said about Drexciya. Its EPs on Detroit labels like UR, Shockwave and Submerge are monumental electro that became instant classics – if we only recall wavejumpaaaa… Drexciya’s first album, “The Quest”, was out in 1997 and included cuts from his earlier releases, thus being more a compilation. 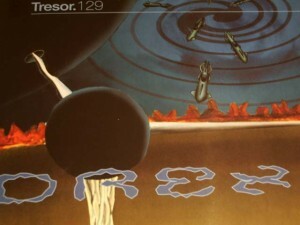 “Neptune’s Lair” was his first real album and marked the start of his European affair, with all remaining releases coming out on Tresor or Clone. Tresor has blessed us with a reissue of the album that combines rougher floor-challenging cuts with sublime sound excursions. Perfect work from the master of underwater sounds. If you are interested in the the story behind Drexciya and its mythology then take a look at a The Wire article published in 1998.